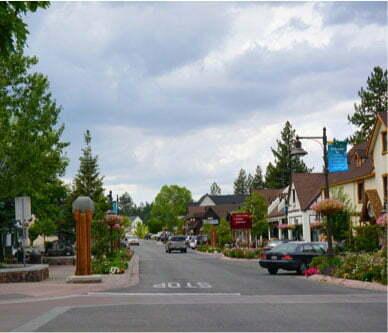 Big Bear Lake is a city that sits in the San Bernardino Mountains and is along the shore of Big Bear Lake. Its proximity to the peaks of the San Bernardino Mountains and the San Bernardino National Forest make for fantastic hiking opportunities. While you are here, you’ll want to reserve a half-day to hike the Cougar Crest Trail, which is one of the most popular in the area for a good reason. It takes you to incredible heights for unbelievable views without the difficulty that some of the other trails in the area have. While hiking is certainly among the most popular activities in this gorgeous area, Big Bear has so much more to offer. 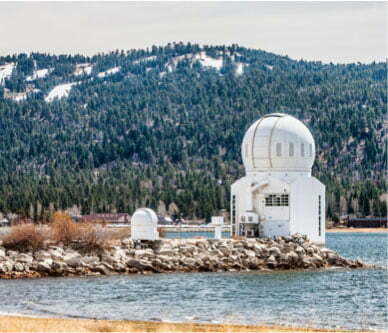 Request a copy of our complimentary Vacation Guide for instant access to top recommendations for things to do in Big Bear. 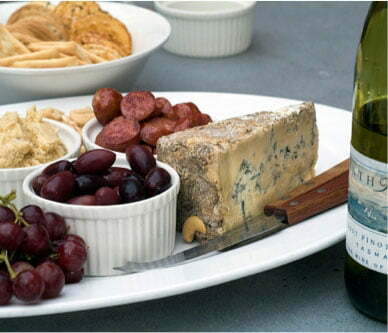 Inside, you’ll find listings for the best restaurants, outdoor activities, shopping, and more! Where Is the Cougar Crest Trail? The Cougar Crest Trail winds its way through the majestic San Bernardino National Forest in Big Bear, CA. The trailhead is on North Shore Drive, about a half-mile from the Big Bear Discovery Center. If you don’t mind walking that half-mile and are looking for Cougar Crest Trail parking, you can park in the Discovery Center’s parking lot. Otherwise, you can pay to park at the trailhead. The elevation of the Cougar Crest Trail is 6,880 feet at the trailhead, and you will climb another 720 feet along the course of this trail. Above all, you can expect breathtaking scenery from this trail. During the summer, wildflowers add bursts of color to the wild greenery and gnarled juniper trees. The real treat awaits you once you gain higher elevations, with panoramic views of Big Bear Lake and the surrounding mountains. If you’re here in the winter, the snow that blankets the surrounding peaks will enhance the beauty. The difficulty is moderate, with steady elevation that brings you to the fantastic vantage points high above Big Bear. You may come across hikers who look prepared for an excursion far beyond the 4-mile Cougar Crest Trail. That’s because the Cougar Crest Trail connects to the famed Pacific Crest Trail, which runs from Mexico to Canada. Mountain bikes are not allowed on the PCT, but if you are on foot, you can continue for another .6 miles from the Cougar Crest Trail to Bertha Peak. This is more of a challenge, but once there, you will be rewarded with additional incredible views of Big Bear Lake. To park at the Cougar Crest Trail, you have to purchase an Adventure Pass for a small fee which helps support the preservation of the forest. Additionally, smoking and campfires are prohibited due to the danger of wildfires (which more often than not are caused by people!). You can bring your pup along, provided you keep him or her on a leash at all times. Be sure to bring lots of water and sunscreen with you, and to have proper hiking shoes. And last but not least, don’t forget your camera! 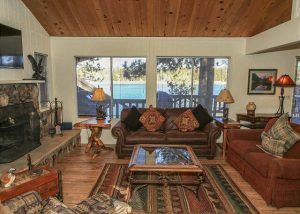 Come back after your challenging hike through Big Bear’s trails and recharge in a comfortable Big Bear Lakefront Cabin. 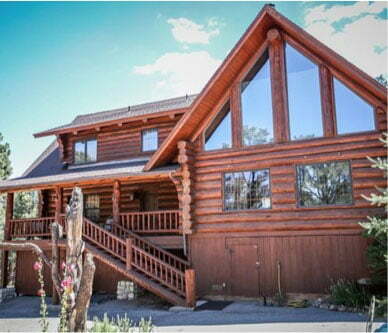 We provide luxury cabins in the best locations, ensuring that you get the most out of your vacation. Our spacious, pet-friendly Bay View Cabin is a great place to relax. This property is newly remodeled, and the living room and kitchen occupy an open-floor plan. Several large windows let in natural light while giving you views of the water. If you’re here during the winter, curl up with a book by the wood-burning fireplace. Lounge on the large deck with a glass of wine and watch the colors spread through the sky as the sun goes down over Boulder Bay, which is part of Big Bear Lake. We have cabin rentals that accommodate a range of group sizes, so whether you are on a romantic getaway or family vacation, we are sure to have a place that suits you (and your pets!). Browse all our cabins and book today!